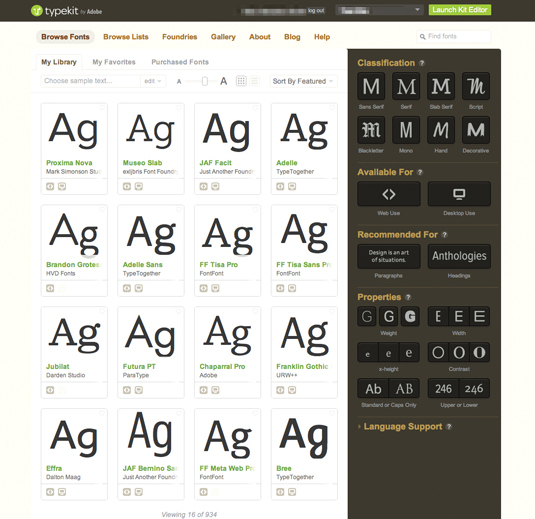 With hundreds of fonts on offer from some of the world’s leading foundries, Typekit lets you add weight to your websites with high-quality web fonts. For a professional designer there’s no comparison to using the expertly designed typefaces found on Typekit. You have access to the highest calibre of web fonts from foundries including the likes of Adobe, FontFont, P22, Typodermic, and Veer – and of course, it’s tightly integrated into your Creative Cloud workflow. Here’s how to get started in nine simple steps. If you’re a subscriber to Creative Cloud, you’ve already got a subscription to Typekit at the Portfolio plan level. 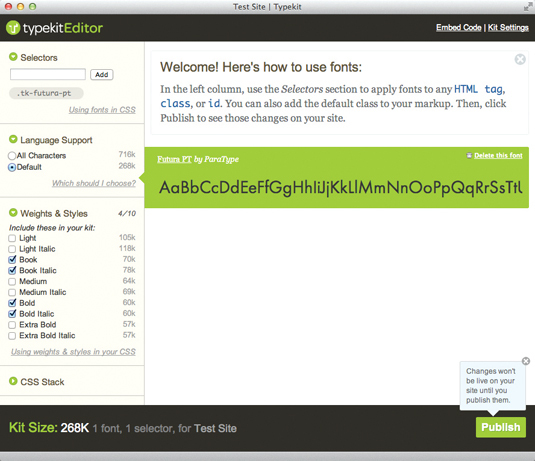 Simply visit www.typekit.com and sign in using the Adobe ID you use to sign into Creative Cloud. 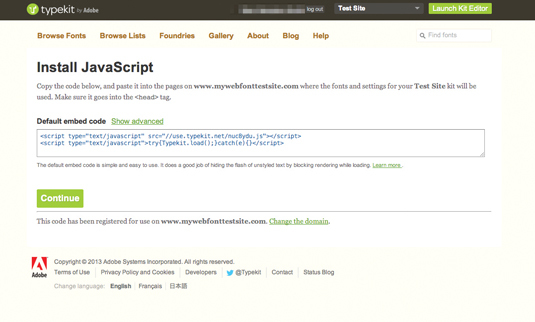 Then you can start accessing the service and using web fonts. 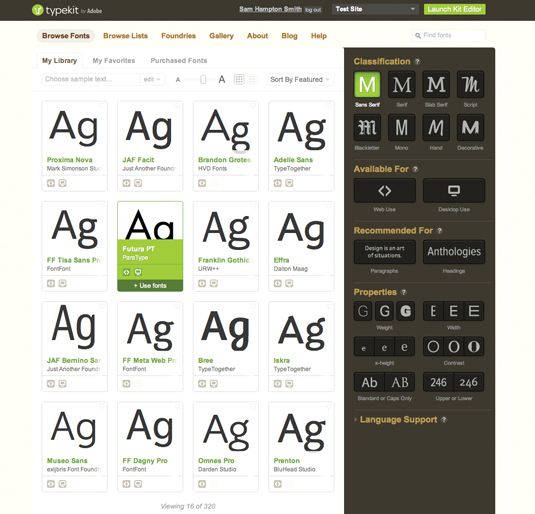 The Typekit library includes nearly one thousand different fonts, each categorised according to their characteristics, usage and weight. Have a quick browse around to see the full selection of fonts available. 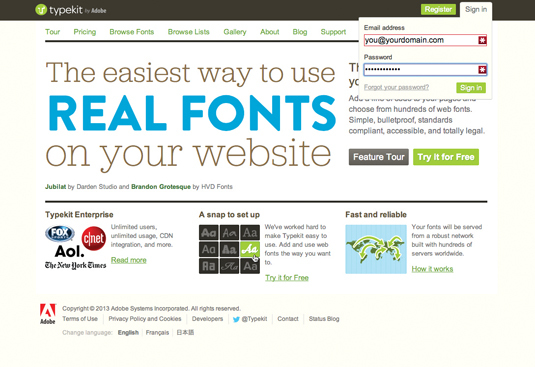 Once you’re ready to start picking fonts for your site, continue to the next step. Click on the dropdown menu at the top-right of the page, and choose the Add New Kit button to create a kit that will work on your chosen domain name. 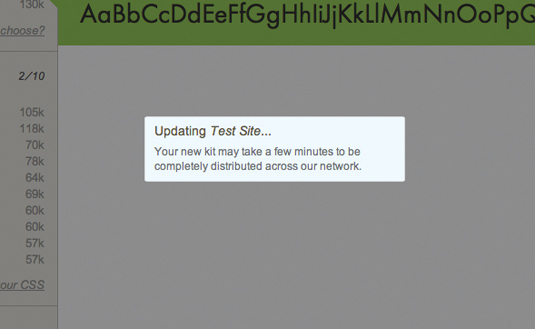 Next, enter the details of the domain that you’re going to use, and click the Continue button to generate the kit. Once you’ve chosen a font you would like to use on your website, hover over the preview to see the different ways in which you can use your selection. 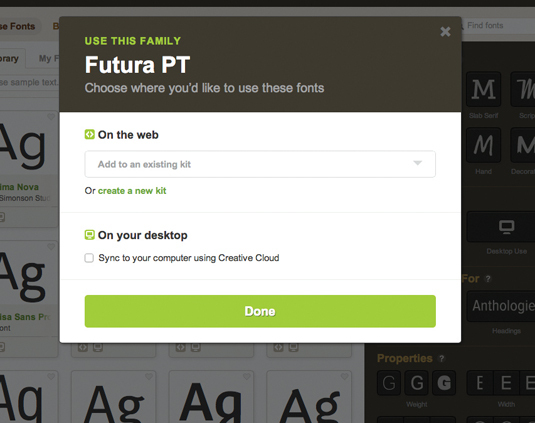 Some fonts are also available for desktop use once you’ve signed up to the beta. Click on the Use Fonts link to continue. From the pop-up modal dialog, choose the kit you would like to add the font to. You can also check the tick-box to send compatible fonts to your desktop for use in InDesign, Photoshop and Illustrator as well as other desktop apps. Choosing an existing kit will open a new window. 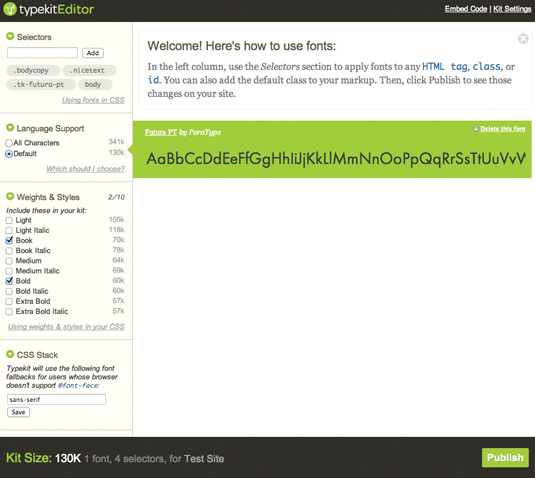 When you use a font on the web, you’re sending the contents of that font to every website visitor. This can get quite heavy if you’ve got the full set of weights and characters. 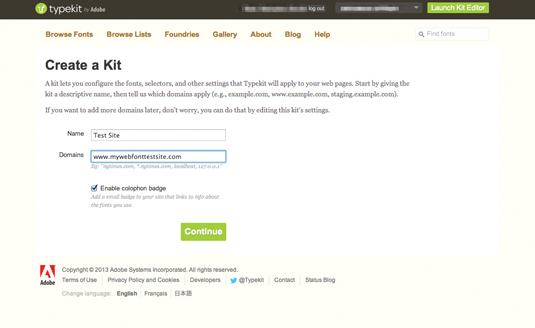 Typekit enables you to choose a subset of weights and characters, reducing the download for each user. By default, Typekit will set you up with a CSS classname you can apply to elements so they render type in your chosen font. You can add your own classes using the field in the top-left corner of the kit editor. You can also specify fallback fonts in the CSS font stack by completing the form at the bottom-left. Once you’re happy and you’ve added any extra typefaces you would like to use on your website, click the Publish button to send your kit out onto the web for use. It can take a couple of minutes for your kit to become available, after which you’ll see your site rendering beautiful Typekit-powered text. This article was originally published in The Ultimate Guide To Adobe Creative Cloud. This entry was posted in Applications, Resources and tagged Application, fonts, Resources, Typekit. Bookmark the permalink.